A brig is a vessel with two masts. Brigs were very popular in the 18th and early 19th century, due to their speed and maneuverability. Both masts were square-rigged. Brigs were used as merchant ships and, with 10 to 18 cannon, as ships of war. This brig is made as a waterline model. The ship is on port tack in quartering wind. The studding sails are set, too. 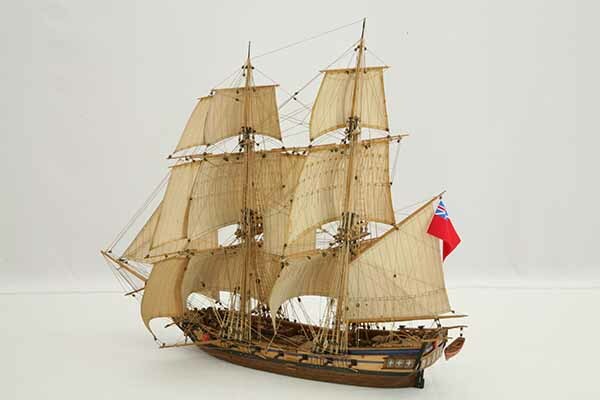 This model of a brig is a beautiful and elegant masterpiece, especially in detailing the rigging. It was built in the 1970s and has been restored with great care. The ship model is 1 : 80 scale. Length is 55 cm, width 29 cm, height 49 cm. Have a look at the set of photos. There are several views of the entire ship model taken from all directions and several closer views of hull, deck and rigging. Click images to enlarge!